We purchased our Christmas tree yesterday! We ended up getting a smaller one than we'd planned on because we just couldn't bring ourselves to go with the Scotch Pine (which apparently is native to the area and therefore cheaper). Scotch Pines are bushy with super long needles. Because they're so bushy they look even shorter than they already are. The ones at the farm also had a very pale green color that didn't appeal to me. And, every time I looked at one I heard Lina Lamont saying, "I can't make love to a bush!" So, yeah, that wasn't going to cut it. 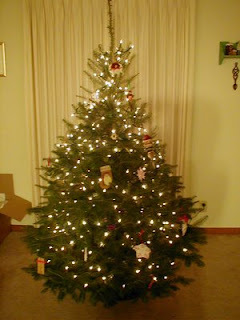 All the fir trees are more expensive, so hence why we had to get a shorter one. But that's okay since we don't even have enough ornaments to fill what we got! Getting our first ever Christmas tree has also helped us realize that we don't have many decent tools. We didn't realize until after we'd got the tree in the stand and put water in that we were supposed to cut off some more of the trunk so that the tree would actually drink. We waited for several hours to see if it'd be okay anyway, but it didn't drink any water so we attempted to do what we'd forgotten to earlier. But we only had a really, really thin saw blade - the kind that are fairly flexible - ring a bell anyone? Definitely not what we needed for the job. Halfway through the trunk it snapped out of the handle and we were left with a twisted saw blade. All we could do for the other half was try to drill (with a hand-crank drill) away some of the base. We succeeded in making a few small dents on the second half of the trunk before we decided to give up. At least our tree is drinking, albeit rather small amounts. Thankfully it only has to last a week. I think we'll try to actually own a decent tree-trunk-cutting saw by this time next year. Ah, I love the Lina Lamont quote. Merry Christmas! We went with the Scotch Pine for our Christmas tree. I love the it because the needles are (a little) prickly, Hallie investigated a few times and discovered it wasn't worth it. Now the presents and pretty ornaments aren't even enough to tempt her... oh man, I really am a bad mom! Good point, Amy. That is the only problem with what we got - the needles are rather soft, so Gareth has no compunction about going up and grabbing ornaments off the tree (which he then runs to give me while saying "back! back!" so that I can put it back) or using the tree as a hiding place when I'm trying to get him dressed. I remember our first Christmas tree. It was tall and skinny. It looked like the top third of yours but all the way down. I really like the beautiful lush branches you got on your bottom two-thirds! Dad has always had a desire to give his kids tools for Christmas! All you have to do is ask!